Part 1: An Introduction to Analytical Pyrolysis. 1. Introduction and Nomenclature. Pyrolysis as a chemical process. The scope of analytical pyrolysis. Analytical pyrolysis applied to natural organic polymers. 2. The Chemistry of the Pyrolytic Process. General remarks. Elimination reactions in pyrolysis. Rearrangements taking place in pyrolysis. Oxidations and reductions taking place in pyrolysis. Substitutions and additions taking place in pyrolysis. Typical polymer degradations during pyrolysis. Pyrolysis in the presence of additional reactants or with catalysts. 3. Physico-Chemical Aspects of the Pyrolytic Process. Thermodynamic factors in pyrolytic chemical reactions. Kinetic factors in pyrolytic chemical reactions. Models attempting to describe the kinetics of the pyrolytic processes of solid samples. Pyrolysis kinetics for uniform repetitive polymers. Pyrolytic processes compared with combustion. Pyrolysis process compared to ion fragmentation in mass spectrometry. Theoretical approaches for chemical pyrolytic reactions. 4. Instrumentation Used for Pyrolysis. The temperature control of the pyrolytic process. Curie point pyrolysers. Resistively heated filament pyrolysers. Furnace pyrolysers. Radiative heating (laser) pyrolysers. Other pyrolyser types. Comparison of analytical performances of different pyrolyser types. 5. Analytical Techniques Used with Pyrolysis. The selection of the analytical techniques and the transfer of the pyrolysate to the analytical instrument. Pyrolysis-gas chromatography (Py-GC). Mass spectrometers as detectors in pyrolysis-gas chromatography. Pyrolysis-mass spectrometric (Py-MS) techniques. Data interpretation in pyrolysis - mass spectrometry (Py-MS). Infrared spectroscopy (IR) used as a detecting technique for pyrolysis. Other analytical techniques in pyrolysis. Part 2: Analytical Pyrolysis of Organic Biopolymers. 6. Analytical pyrolysis of polyterpenes. Natural rubber. Vulcanized rubber. Other polyterpenes. 7. Analytical Pyrolysis of Polymeric Carbohydrates. Monosaccharides, polysaccharides and general aspects of their pyrolysis. Cellulose. Chemically modified celluloses. Amylose and amylopectin. Pectins. Gums and mucilages. Hemicelluloses and other plant polysaccharides. Algal polysaccharides. Microbial polysaccharides. Lipolysaccharides from the cell surface of bacteria. Fungal polysaccharides. Glycogen. Chitin. Proteoglycans. 8. Analytical Pyrolysis of Polymeric Materials with Lipid Moieties. Classification of complex lipids and analytical pyrolysis of simple lipids. Complex lipids. 9. Analytical Pyrolysis of Lignins. Lignin. Lignocellulosic materials. Chemically modified lignins. 10. Analytical Pyrolysis of Polymeric Tannins. Polymeric tannins. 11. Analytical Pyrolysis of Caramel Colors and of Maillard Browning Polymers. Pyrolysis of caramel colors. Sugar-ammonia and sugar-amines browning polymers. Sugar-amino acid browning polymers. 12. Analytical Pyrolysis of Proteins. Protein structure of pyrolysis of amino acids. Peptides. Simple proteins. Conjugated proteins. 13. Nucleic Acids. Classification of nucleic acids and pyrolysis of oligonucleotides. Pyrolysis of nucleic acids. Pyrolysis of Pt-DNA complexes. 14. Analytical Pyrolysis of Several Organic Geopolymers. Humin, humic acids, and fulvic acids. Coal. Peat. Kerogens. 15. 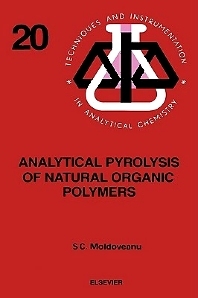 Analytical Pyrolysis of Other Natural Organic Polymers. Uncommon organic polymers. Diversity of organic polymers. Part 3: Applications of Analytical Pyrolysis on Composite Natural Organic Materials. 16. Analytical Pyrolysis of Plant Materials. Wood. Leaves and other plant parts. Decomposing and subfossil plant materials. Pulp and paper. 17. Analytical Pyrolysis of Microorganisms. Characterization of microorganisms by pyrolytic techniques. Utilization of pyrolytic techniques to detect biomass. 18. Other Applications of Analytical Pyrolysis. Pyrolytic techniques used in pathology. Pyrolytic techniques used in food characterization. Pyrolytic techniques used in forensic science, archeology, and art. Pyrolysis used for waste characterization. Analytical pyrolysis is one of the many tools utilized for the study of natural organic polymers. This books describes in three parts the methodology of analytical pyrolysis, the results of pyrolysis for a variety of biopolymers, and several practical applications of analytical pyrolysis on natural organic polymers and their composite materials. Analytical pyrolysis methodology covers two distinct subjects, the instrumentation used for pyrolysis and the analytical methods that are applied for the analysis of the pyrolysis products. A variety of pyrolytic techniques and of analytical instruments commonly coupled with pyrolysis devices are given. The description of the results of pyrolysis for biopolymers and some chemically modified natural organic polymers is the core of the book. The main pyrolysis products of numerous compounds as well as the proposed mechanisms for their pyrolysis are described. In this part an attempt is made to present as much as possible the chemistry of the pyrolytic process of natural organic polymers. The applications of analytical pyrolysis include topics such as polymer detection used for example in forensic science, structure elucidation of specific polymers, and identification of small molecules present in polymers (anti-oxidants, plasticizers, etc.). Also, the degradation during heating is a subject of major interest in many practical applications regarding the physical properties of polymers. The applications to composite polymeric materials are in the fields of classification of microorganisms, study of a variety of biological samples, study of fossil materials, etc. Analytical pyrolysis can also be used for obtaining information on the burning area generate pyrolysates that have complex compositions. Their analysis is important in connection with health issues, environmental problems, and taste of food and cigarettes. • Presents analytical pyrolysis as a uniform subject and not as a conglomerate of scientific papers. • Puts together in an organized manner a large volume of available information in this specific field. • Provides original results which address subjects with relatively scarce information in literature. • Gives original views on subjects such as the parallel between the pyrolytic process and the ion fragmentation in mass spectrometry. • Includes the role of pyrolysis in the burning process. The three parts of the book are covered in 18 chapters, each divided into sections. Some sections are further divided by particular subjects. References are given for each chapter, and an effort has been made to include as much as possible from the available representative information. A few unpublished personal results are also included.